There should be a word for it: the fear of touching the inside of your tent lest the water start dripping onto you. If there is such a word, it might now be considered archaic. Most tents don’t behave like that any more. In theory at least you shouldn’t have to worry that condensation on your inner wall will combine with rain on the outside to form pools in your tent. 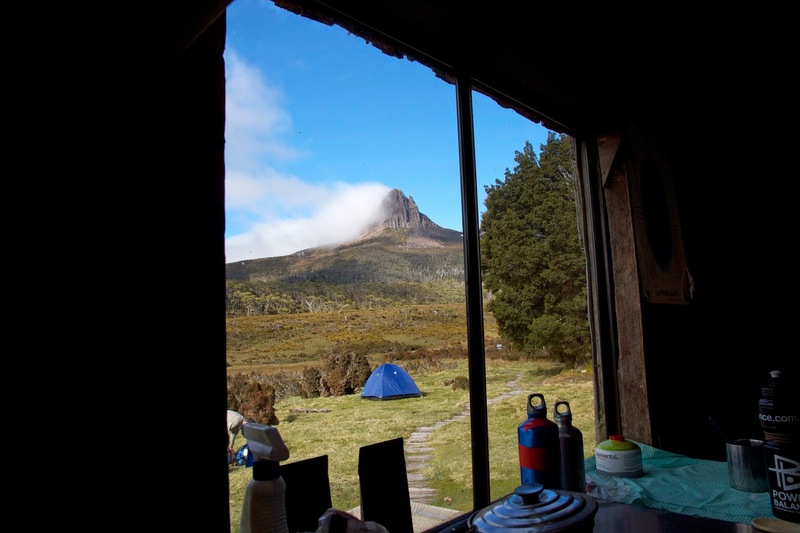 That’s largely thanks to bushwalking tents having double skins, with a mesh or solid inner tent held clear of the solid outer fly. And having a floor. 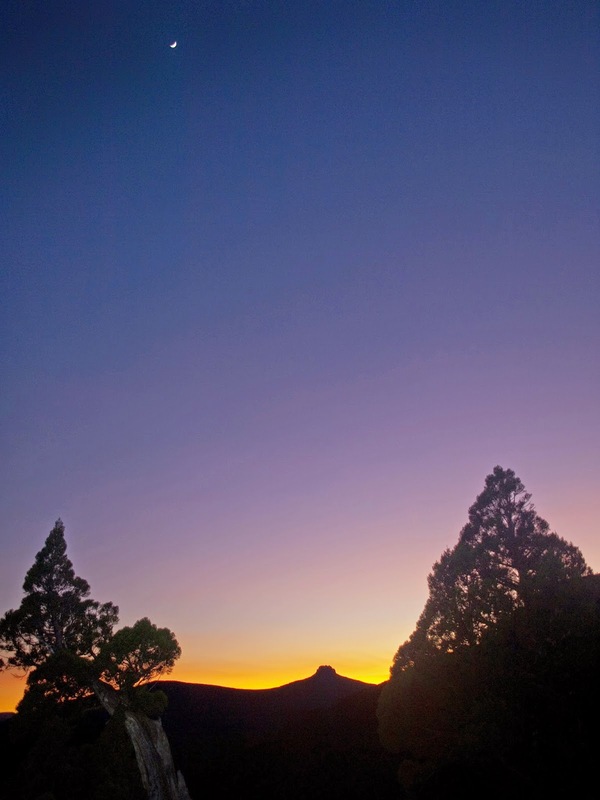 But when I first started bushwalking in the 1960s, single wall japara tents were state-of-the-art. Japara, a close-weave type of cotton impregnated with wax, repelled water quite well. However water on the outer surface could wick through and start dripping on you during persistent rain, especially if you helped it find a way in by brushing the inside wall of the tent. Our camp leaders hammered into us the need to avoid this. Consequently my vivid early memories of nights in tents include huddling towards the centre of it during rain. “Never touch the tent wall” was up there with “don’t bump the turntable” when a vinyl record was playing. The strictness of the rules never prevented me from going camping; nor from buying records for that matter. 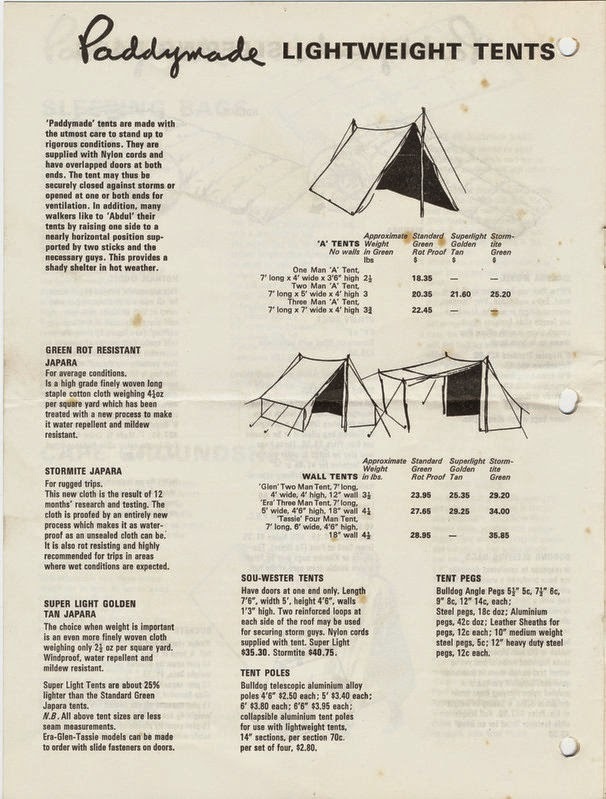 By the early 70s I had saved up for my own Paddymade Glen two person tent. I was a nascent gear freak even then, because I remember it being a step up from earlier tents. Rather than being a straight A shape, it had small vertical walls at the bottom of the sloping roof. This all-important innovation helped keep the sloping wall further away from the sleeping camper, keeping them drier. [A Paddy Pallin catalogue ca. 1970, featuring a Glen Tent (centre). But they still had their issues. Firstly they didn’t yet have a built-in floor. In some settings we would put down bracken fronds as a tent base, and to keep the floor drier we might add a plastic groundsheet. To stop water from flowing through your tent, the common practice was to dig drainage ditches all around your tent. Many campsites still bear the scars. We discovered another major problem when we took the tent to New Zealand during university holidays. The tent flaps had no zipper, and could only be tied together to secure them against insects. No matter how particular you were, you always left good sized air gaps. We suffered serial invasions of sandflies (until dark) and mosquitoes (after dark) whenever we slept in places where these bities were common. But tents have always had numerous virtues, and these only increased once floors, zippers and double skins were added to them. While a hut chooses an overnight site for you, a tent allows you to stop and camp almost anywhere. That sometimes proves to be a bigger plus than it sounds. What could be better than waking up to a billion dollar view that is just yours? And having just a thin wall between you and the world can be an incredible experience when that world is devoid of mechanical noise and filled instead with the roar or whisper of wind; the crash or lap of waves; the trickle or chuckle of a creek; the thump or growl of the night’s beasts. 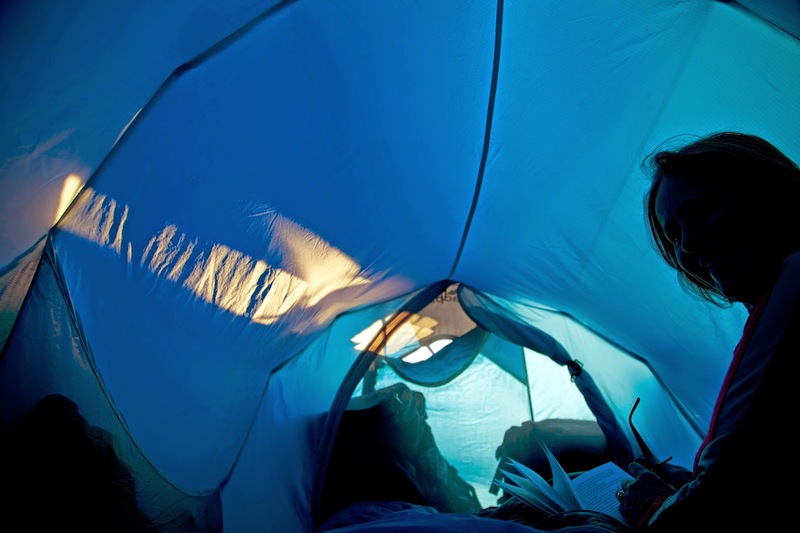 And when the dawn chorus starts, stuttering at first, then building to a crowded crescendo of uniquely local song, a tent is a heavenly place to be. That’s when you lie back and feel thankful you live in a place like this.